Written by Barry Kessler. 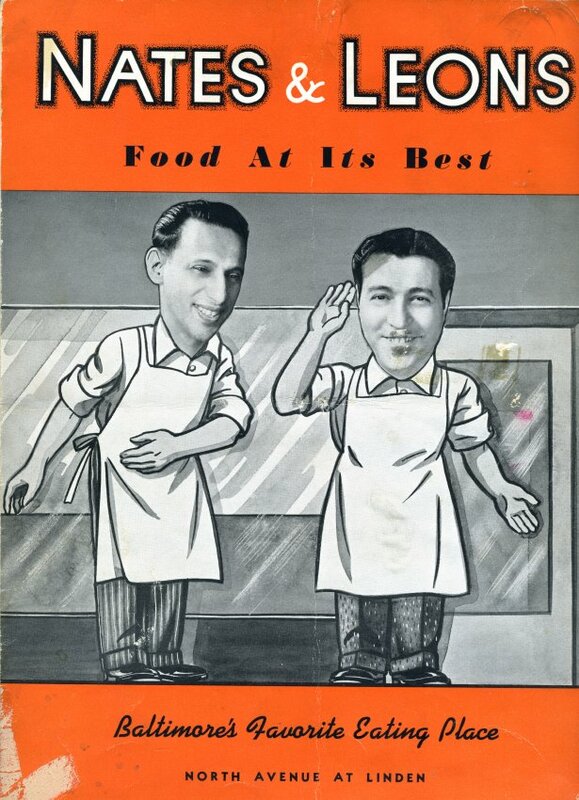 Originally published in Generations 1993, reprinted in Generations 2011 – 2012: Jewish Foodways. Missed parts 1 – 9? Start here. Attman’s Delicatessen is the longest survivor of the East Baltimore delis, still busy on Lombard Street where it is now one of the few remainders of the community which once thrived there. It remains in the family, although the Attmans have prospered and now hold extensive real estate and other businesses interests. Yet it was one of the most recent delis to convert from a take-out grocery to a sit-down restaurant. Harry Attman came to Baltimore around 1920. An immigrant from a village near Kiev who had learned the grocery trade in Providence, Rhode Island, he was the oldest child of a large family and the first to immigrate. He brought the others over, including his parents, one at a time. He and his wife Ida, from Poland, purchased a small grocery at 2000 East Baltimore Street. They continued to live there even after 1933, when they acquired the beginnings of today’s deli, a small grocery store at 1019 East Lombard Street, then owned by Nathan and Elise Weinstein. They bought out their partner in the purchase, Lipshitz, by 1940, but continued to call the place A. and L. Cut Rate Grocery Company for several years. Meanwhile, Harry’s brother Joseph and his brother-on-law Morris Sefret purchased the Atlantic Import Company, only one block down Lombard Street, from Philip and Pincus Cohen. Abraham, Anna, Joseph, and Shmare Attman were earning their livings at Atlantic Import in 1937. 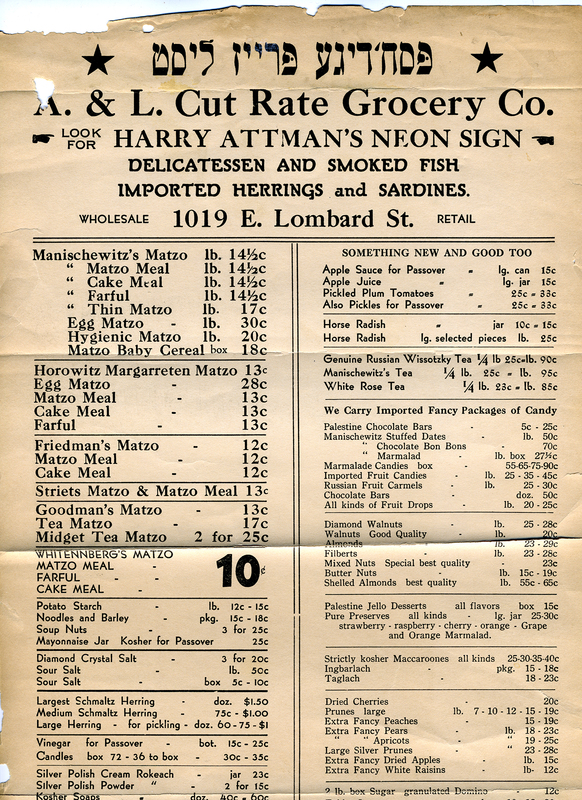 Photographs and price lists from the 1930s show Harry Attman’s carrying on a bustling trade in Jewish food specialties, especially at Passover. Mail orders from customers and retail groceries far and wide formed a large component of the business. Besides packaged matzah and other kosher-for-Passover products, Attman’s offered coffees, teas, nuts, dried fruit, spices, herring, and delicatessen meats. The store cured its own pickles; raw vegetables came from the Marsh Market near the Fallsway at a quarter a barrel, and McCormick & Co. and Baltimore Spice ground loads of garlic to a special course blend for its use. The nature of the business changed dramatically during the 1940s. As the Jewish community moved away from East Baltimore and supermarkets drew away price-conscious grocery shoppers, Harry Attman and his son Seymour, who increasingly helped with the business, focused more on sliced meats and the luncheon trade of hot dogs and sandwiches. 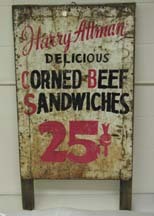 Although AHarry and Ida were religious people and kept a kosher home, the corned beef and tongue sold at Attman’s came from non-kosher sources and the delicatessen never presented itself as kosher. Indeed, although during the war years the local rabbis successfully enforced the observance of Sabbath, afterwards Attman’s and the other shops on Lombard Street defied their authority and opened on Saturdays. After the war Attman’s proudly promoted the slogan “Home of Fifty Sandwiches.” Leaning up against a counter in the narrow, crowded shop, patrons could eat sandwich combinations Harry and Seymour Attman invented or borrowed from famous uptown delis such as Nates and Leon’s, and Ballow’s, or the Carnegie Del in New York. Five years after his father’s death in 1968 Seymour Attman opened the “Kibitz Room,” decorated with posters and old photographs; customers carried their sandwiches over on plastic trays. Since then the clientele has become increasingly non-Jewish, now ranging up to 65 percent during luncheon hours. 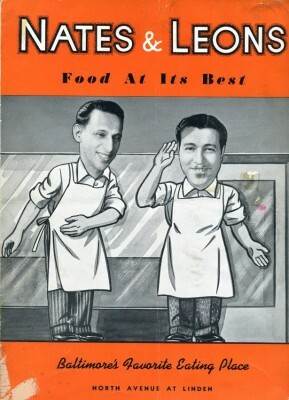 More than two hundred delicatessens are listed in today’s Yellow Pages – some of them direct or indirect descendants of specialty grocery stores established by Jewish immigrants from Eastern Europe in Baltimore decades ago; others related to them only be association, real or intended, with the concept of a lively, aromatic, ethnic sandwich shop. 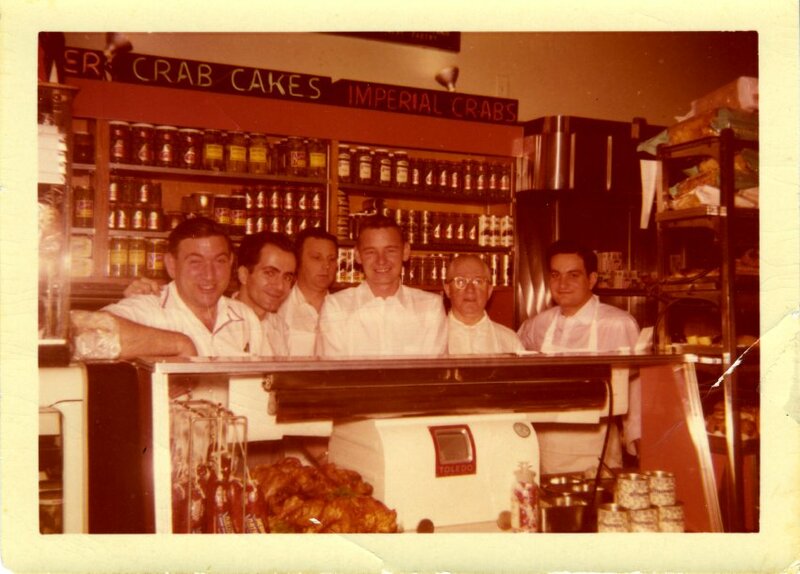 The remarkable personalities of the great delicatessens and the flavors of their foodstuffs constitute a uniquely American Jewish heritage that has enriched Baltimore as a whole. Interview with Seymour Attman (December 1992). Jewish Museum of Maryland, 1990.89. Interview with Seymour Attman (September 1992). Missed parts 1 – 8? Start here. Nates and Leon’s is still legendary in Baltimore. For 32 years, from 1935 to 1967, Nates Herr and Leon Shavitz ran one of Baltimore’s most popular eateries, open around the clock, “a meeting ground for the rich and poor, the famous and would-be famous, the old and the young, everyone from bookmakers to judges and debutantes.” Centrally located at 850 West North Avenue, Nates and Leon’s attracted a wealthier and more diverse crowd that the neighborhood-oriented Ballow’s (further west on the same street). It had a mix of politicians, sports figures, rabbis (from Reform temples), department store owners, young couples leaving movie palaces nearby, and performers starring at Pennsylvania Avenue nightclubs and downtown theaters. About a third of the clientele was not Jewish, many of them having been first brought by Jewish acquaintances. All rubbed shoulders in a high-spirited camaraderie engendered by the late hours, Leon Shavitz’s extroverted enthusiasm, and mountains of delicious food. Nights were a social field-day of table-hopping, wide-ranging gossip, seeing and being seen – and getting in on a good football pool. The layout was familiar: shelves filled with cans of soup, jars of olives and boxes of crackers, among other specialty groceries, lined one wall in front of which was a long counter, partly refrigerated, containing the meats, cheeses, smoked fish, and prepared salads. Breads and pastries were piled above; pickle-barrels jostled in front. Countermen, including both Nates and Leon at times, worked behind it waiting on the carry-out trade, slicing meats, cooking on the grill, and constructing sandwiches of mind-boggling complexity at dizzying speed. Waitresses, both Jewish and Gentile, worked the booths and the white Formica tables; they made good tips. Aficionados still rhapsodize about Nates and Leon’s food. The pastries – strawberry cake, napoleons, and eclairs – were made by Nates and Leon’s German chef Henry Hoefges, brought down from New York. Baltimoreans remember the incredible chicken salad, the luscious chopped liver, and the Number Three Combination sandwich of corned beef, coleslaw, lettuce, and Russian dressing. 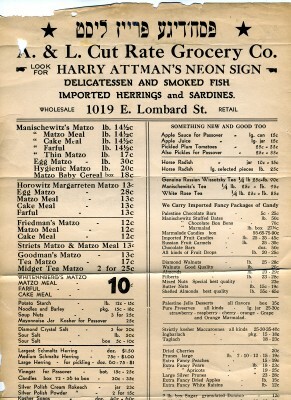 A series of menus dating from the mid-1930s to the restaurant’s move away from North Avenue to the Pimlico Hotel in 1950 reveals a progression of combination sandwiches: from the original fourteen, based on corned beef, lox, and sturgeon, to 120 elaborate confections incorporating turkey, tongue, Bermuda onion, tuna salad, sardines, chopped liver, bacon, and hard-boiled eggs. Baltimore Sun, “Nathan J. Herr, Co-owner of Nates and Leon’s, at 83,” December 15, 1980. Interviews with Reta Davis (July 1991), Duke Bergerson (August 1991) and Jerome Tucker (January 1992). Davis is the daughter of Leon Shavitz; Bergerson and Tucker are former Nates and Leon’s counterman. Jewish Museum of Maryland, gift of Rheta Davis, 1992.53k. Miss parts 1 – 7? Start here. Awrach and Perl’s delicatessen was located on Howard Street in Baltimore’s retail shopping district, where many Jewish people worked in the numerous clothing and department stores. Advertising itself as a luncheonette, delicatessen, soda fountain, and cocktail lounge, it attracted a mixed clientele; many non-Jews came, including ladies on shopping trips and youngsters headed for the movies. 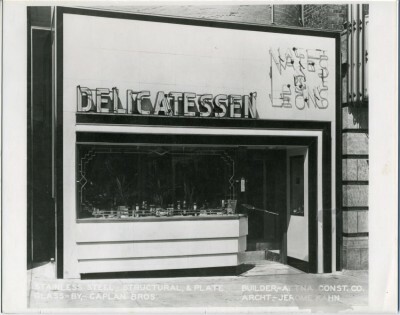 The delicatessen carried on a “madhouse” luncheon trade, especially on Saturday, when the upstairs room because a gathering place for teenagers. Awrach and Perl was also frequented by H.L. Mencken and other well-known Baltimoreans. The owners were two immigrant families from Odessa, successful fruit merchants. They had worked their way up from a pushcart selling bananas on the Lower East Side of New York to a thriving deli in Washington, DC, before moving to Baltimore around 1920. Related by marriage, the families lived together in suburban Forest Park. They belonged to an Orthodox congregation and ate kosher food themselves, although the restaurant was open on Jewish holidays and the menu included bacon, ham, and shrimp salad. The Perls’ two sons and the Awrachs’ two daughters helped out on Saturdays. The families spoke Yiddish among themselves and broken English with customers, their personalities constituting a chief attraction of their establishment. 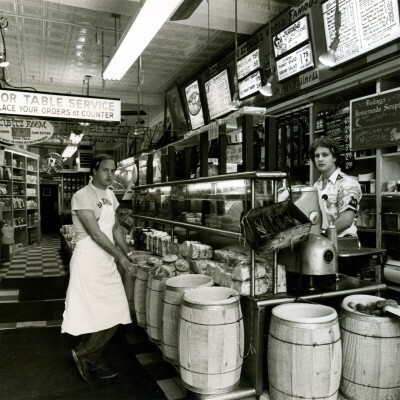 Bright and noisy, Awrach and Perl was a quintessentially Jewish delicatessen, with well-stocked counters piled high with delicious and appetizing foodstuffs. A long counter for making sandwiches ran along one side. A surviving menu from the early 1940s lists sixteen omelets, 47 sandwiches, ice cream confections, steaks and chops, and a wide variety of beverages, ranging from limeade to whiskey. Eastern European dishes such as schmaltz herring, chopped liver, rolled beef, and tongue joined such American-style offerings as lamb chops, a bacon-lettuce-tomato sandwich, and poached eggs. Its general appearance somewhat fancier than the average delicatessen, with a light green color scheme and a black and rust tile floor, Awrach and Perl cultivated a cosmopolitan but casually familiar atmosphere. Max Awrach sat at the cash register near the door, greeting customers; leaving, customers paid according to orange tickets punched by the waitresses to indicate the cost of each item. Over the din one could hear Mrs. Perl, who supervised the upstairs room, calling out “one up,” signaling the most popular order, a hotdog and Coke. The restaurant was reportedly the largest purchaser of hotdogs in Baltimore. Original in possession of Martin Lev. Typescript reminiscence by Hilda Goodwin (December 1992). Jewish Museum of Maryland Memoir Files.